This is a post I have been wanting to write for a long time now, but never really got the courage to rehash the experience that seems like it should have just been something I was watching on tv. I share it today for a couple of reasons. 1. So, anyone who goes through a similar experience doesn't feel alone! 2. So we always have a place to look back and remember how things went down. 3. To share more of our real everyday life with you, our readers. 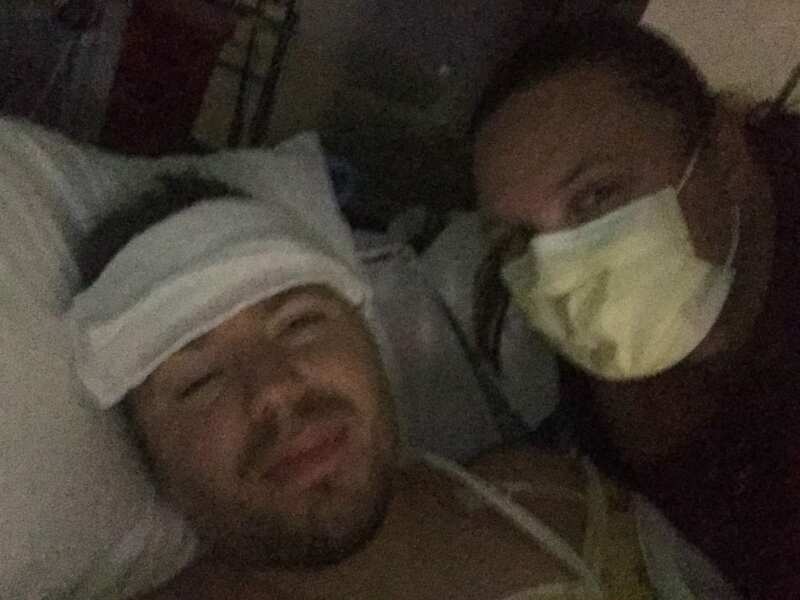 Back in April of 2016, we were less than a month away from a cruise we had been planning for 6 months, and Cliff was trying to get over a head cold that had been bothering him for a few days. He had been experiencing a small fever and a sore throat, but seemed like it was getting better. But, when he woke up on April 25th he seemed even worse! Now, he had a headache that was relentless. In the past few months, Cliff had gone to the ER with a migraine from his braces a couple of times, so I thought the same thing was happening again. Throughout the day he kept saying that the headache was getting worse and worse and it was super painful. Me, the helpful wife I am, kept telling him to rest and it would get better! Eventually it came time to go to bed, and instead of sleeping in the recliner (like he had been doing because of the cold) he slept in our bed. Because usually, if one of us is sick, we will sleep separately trying to stop the whole family from getting sick. I still thank God that he came to our bed that night, because looking back, I think this was the move that saved his life! Because we had the migraine experiences so fresh, and me thinking that's all it was, I suggested waiting until morning to go to urgent care, instead of waiting for hours in the ER and probably ending up getting in a room the same time Urgent Care opened (less than 5 hours from then). With that plan, I gave Cliff some of my prescription Norco (from a past surgery) and we planned to go to Urgent Care if the headache was still there in the morning. But, at least the drugs would help him sleep! He told me right before taking it that he hoped it wasn't a sleep aid, because those made him sleep walk when he was a kid…this is a piece of information that kept me sane for the hours to come! A few hours later, I woke up and could feel that Cliff was shaking in his sleep, with a slight moan. My mind told me that he was still in pain and was dreaming about it (isn't it funny what our brains tell us is happening?). I decided to try and calm him down, and when I reached over, realized the shaking was chills and he was BURNING UP! No need for a thermometer, there was no doubt he had a fever. I woke him up and said “You have a fever, would you like some tylenol?” He said “Yup” and I went to get it and some water. When I came back to deliver the water and medicine, he wouldn't sit up. I kept asking him to sit up and he would just say “Yup!” and then not do it. I was very confused as to what was happening and then remembered him saying “medicine that puts you to sleep makes me sleepwalk”…That was it! The Norco was too strong and he was just hallucinating! Again, this is the piece of information that my brain needed to decide all was ok, and I could handle the situation. Without this, I would have not been so OK.
After trying multiple times to get him to wake up and talk to me, I went to my mom and asked her what I should do (her suggestion, call 911)? I could hear Cliff yelling from the other room, so I quickly went back to him, thinking he must now be waiting for that water. But, when I got to the room, it wasn't really Cliff in the bed. Sure, he was laying there, and yelling things I couldn't understand, but he had no idea what was going on. I asked him if he knew what he was saying and he said yes, and then I asked if he knew who HE was…He said “Yes, Marty!”…and then I knew…He needs to go to the ER. Now, I am still thinking at this point that he is having an adverse reaction to the drugs, NOT that there is something seriously wrong. So, I'm pretty calm, knowing that as soon as it wore off, he would be just fine! Instead of calling 911, I decided I would “phone a friend” instead. (Again, totally unaware that anything is seriously wrong, and I don't know when you are supposed to call 911!) My friend wasn't able to come help me get him in to the car, and also suggested calling 911. I explained to the operator that my husband had been having a bad headache and that I gave him some Norco, that must be causing him to hallucinate, because he is completely incoherent and doesn't know who he is or who I am. Little did I know, there was “Bad” Norco going around on the street at the time, so my phone call triggered a drug overdose response. So, the first person to arrive? The POLICE more concerned with what I was giving him than what was wrong with him. I was basically being questioned on where I got the DRUGS and if I really had a prescription. At this point Cliff was very confused and now trying to stand up. I was pretty scared he would end up handcuffed! Finally the paramedic (and fire department) arrived. Or, Maybe It's A Heart Attack! I got stuck at a light, so didn't get to go right in with the ambulance, and instead had to wait at least an hour in the waiting room to be called back. I found out later that the paramedics thought Cliff was having a heart attack, and the full crash cart team was ready when they arrived. That's why I was so delayed being allowed in the back. Here I was completely unaware in the waiting room! I was finally able to go to the back where Cliff was still very incoherent and still had no awareness of who I was or who he was. I kept retelling the sick > worst headache ever > drugs story to each Dr who came in and tried to figure out what was happening. After it had been over 6 hours from the time I gave him the medicine, the Drs were positive it had nothing to do with that, and everything to do with something else happening inside of his body…but they had no real idea what it was. This is the picture I sent to our friends in a group text to let them know Cliff was in the hospital and we had been here for hours! Except for the nurse wearing red scrubs! She was the sweetest nurse and decided that Cliff should be tested for Meningitis. Which at the time I had NO IDEA what it was. I decided it best NOT to Google ‘What is Meningitis' at the time, because I did not need the extra stress of Dr. Google telling me all the horrible things that could be happening. The only way to test for meningitis was to do a spinal tap and remove spinal fluid and test it. Since Cliff was incoherent, I had to sign consent for them to do the procedure and was made very aware that it would be very painful for him. But, there was no other choice! They quickly prepped him for the fluid removal and I was sent off to the waiting room, where I found multiple friends waiting to just sit with me…Seriously we have THE BEST friends! So we sat and waited for what seemed like hours, and was probably just about an hour. When I was finally allowed to go back into the room, Cliff was back! Not only did he know who HE was, he knew who I was. That had become my gauge for if he was getting any better. I would ask “Do you know who I am?” to be told over and over “No”. But when I walked back into his room after he had the spinal fluid removed, he said “Yes, of course, you are my beautiful wife!”, which to this day still makes me cry to think about. Then I knew, that no matter what the outcome was, he was going to be ok. He was back. The nurse in the red scrubs came in and said she was 99% sure that it was meningitis and explained that the spinal fluid is supposed to be clear, and Cliffs was yellow. They had already started him on multiple types of antibiotics while they waited for the lab results to confirm which type of strain he had and how to attack it directly. I don't know if it was the pain of the spinal tap or the release of pressure, but that was the point when Cliff started to be more aware of what was going on. Even though he was confused every-time a nurse came in as to why he was there in the first place. He was still very tired and would come in and out a lot. To this day, the pain of the spinal tap is what he remembers first about the whole incident. Before that, he has no memory of the whole thing. Cliff wanted me to share a picture on Facebook to let people know he was feeling better. Even though it may not show, it was a huge improvement. Cliff was admitted to the ICU where he would spend the next 3 days being pumped full of antibiotics, and wondering why he couldn't just go home already! The crazy thing with the meningitis is it came on so fast and so strong, but as soon as they started to treat it he was feeling so much better. After about 24 hours of being in the hospital, he was ready to go home. Although he was still very tired, he was getting up and moving around as much as they would allow him. I remember he wanted regular clothes from home, so he was dressed and sitting up in the chair (attached to IVs of course) and one nurse looked in to say “Are you ok? We aren't used to patients sitting up and moving around here in the ICU”. Everything was moving upwards and the last days just seemed like a blur. Something that could have quickly killed him (meningitis is an infection that spreads to your brain) or had major lasting symptoms was on it's way to just being a scary memory. 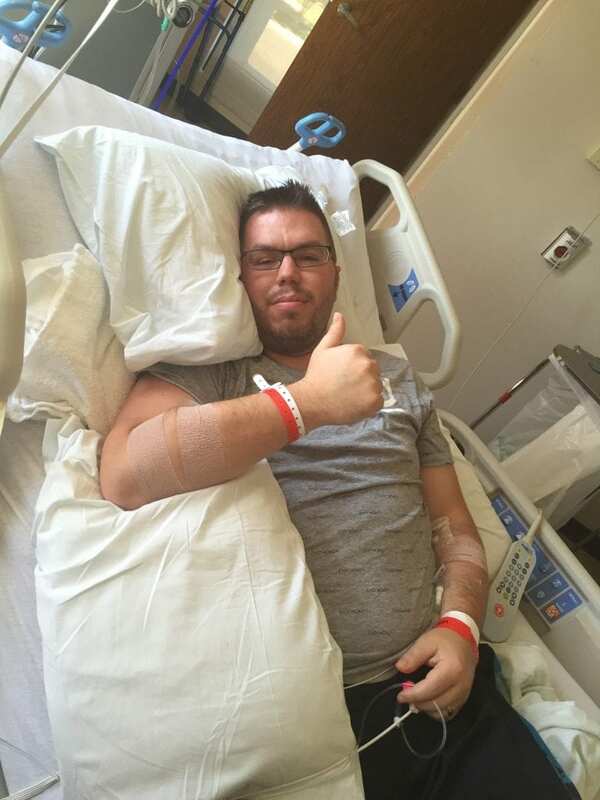 This is Cliff still in the ICU, giving a thumbs up that he's feeling much better! Wearing his regular clothes and wanting to go home ASAP. Remember that cruise we had been planning? Well, Cliff was determined that he was STILL going on that thing! Every doctor who came in the room to talk to him, he would say “As long as I'm good to go in 11 days, it's ok” and each one would say “I'm really sorry, you will not be going on that cruise!” He was feeling so much better (in comparison) that he was sure he would be just fine to go on the cruise! After 3 days in the ICU, he spent another 2 days in a private hospital room. Although he felt much better, he still needed a lot of antibiotics and monitoring. 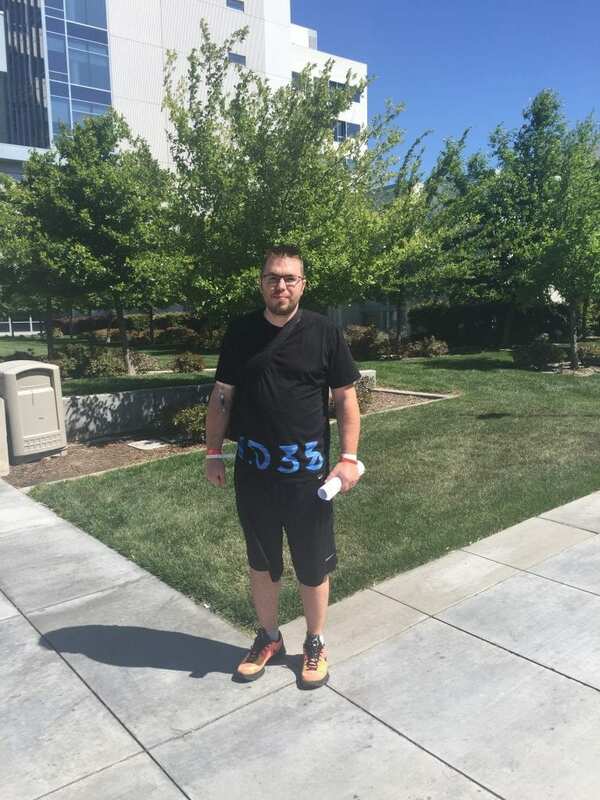 Even after being released from the hospital, it wasn't over. He was released to the care of a home health nurse who would monitor him and make sure he was getting better. Before being released a “midline” was installed in his arm so that he could continue to receive IV antibiotics for another 14 days at home. This is a line that goes into your vein, and you can put an IV line into it when needed. The home health nurse showed us how to administer the antibiotics 3x a day and I became Nurse Jessica! Needless to say, those 14 days overlapped the cruise, and we did not make it on the trip! We did finally go on our first cruise, even though we lost over $12,000 on the first one (now we always purchase travel insurance). Cliff had to prove he was strong enough to go home, so every chance he got, he was walking the halls of the ICU. I would like to say that after the antibiotics were completed everything went right back to normal, but that isn't how things work with infections that almost kill you. Even though we had left the hospital, Cliff still had bad vertigo and would experience slight dizziness. He also had times where loud noises would cause extreme pain in his head. One of the long term side effects Cliff experienced after getting better from the Meningitis was anxiety and fear of getting or being sick again. Or that there would be other lasting side effects. The first time that he got a cold again after being hospitalized it caused a lot of panic and even a fear of going to sleep. This is something that still effects him when he gets a cold. Easy to understand, when you just had a cold and then woke up in the hospital a day later! Same thing with headaches. There is always more caution when he has headaches now. Some people suffer things like hearing loss, blindness and other permanent disabilities from having meningitis. We are very thankful that Cliff did not experience any permanent disability from the infection. The experience really showed me just how fragile life really is. That we just don't have guarantees that things will be ok forever. No matter the promises we make to each other, “to live until we are 99 and die peacefully together in our sleep”, things happen. I am also much more likely to take someone to the Emergency Room or call 911 instead of just assuming that everything will be fine! This was Cliff leaving the hospital after the 5 days that changed our lives forever. So thankful for health and surviving this! Do you have any similar stories yourself? Or has anyone you known been effected by an illness like this? 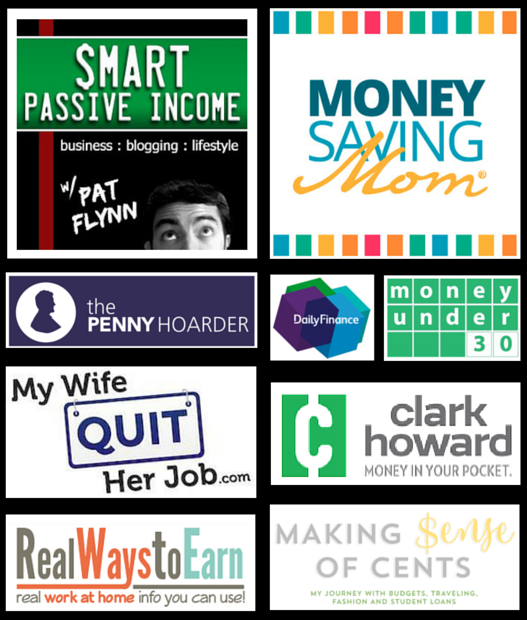 Want To Hear From Us Regularly? I’m glad to hear he has had such a great recovery! Thanks for sharing with us. Thanks for sharing. My experience was similar. At the same time I had Viral Encephalitis. Excruciating. I don’t even remember experiencing any pain with the spinal tap. No real resolve, perhaps a mosquito bite even though we could never find the bite. My dad went through the same thing. We actually ended up in the same hospital as I was battling a kidney infection. I can still remember hearing them call codes to his room as he was so confused and fighting the orderlies. The vertigo also stayed with him for quite awhile. Glad to hear things turned out well for your dad! It is so scary seeing them disoriented like that. Wow, thanks for sharing. It does sound so familiar! Yes, he does the same with every single headache. We pray that eventually, the feeling won’t be there. Congrats on starting Amazon! I was expecting an FBA related story and read something much more meaningful and thought provoking. Thank you for sharing. Hi Jessica and Cliff. Thank you for sharing this story with us. You take each day for granted and never think of things like this, this was great information to make me make sure everything is in order and not take anything for granted. I am so very sorry you’re family went through this and I’m so very happy things turned out good. Thank you again for sharing. Hey Julie, it is so true. We just don’t realize in everyday life how quickly things can change. So glad Cliff got through it well too! Thanks for sharing your story as well Mima. I’m so glad to hear your brother came through. Wow Ruth, thanks for sharing! That “little voice” is so important. Glad to hear the nurse was so great. They make all the difference sometimes. 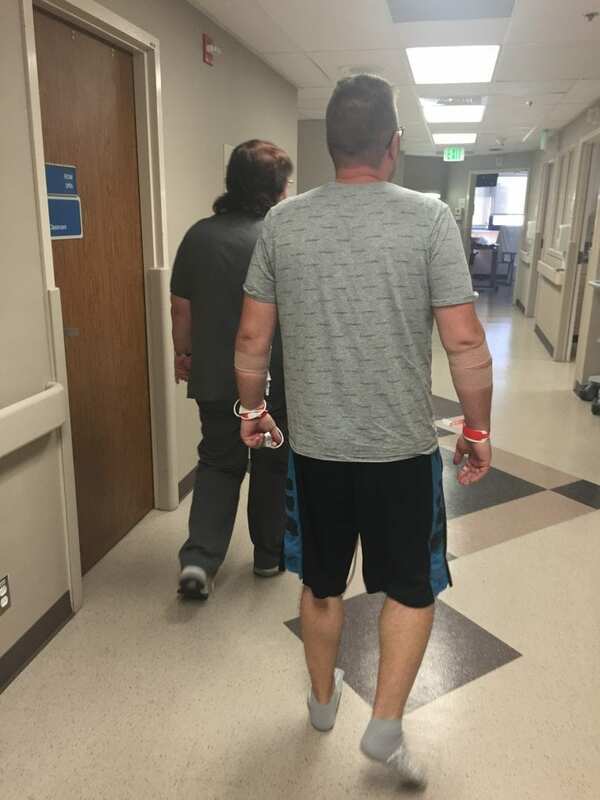 My 6-foot-2, trained-killer husband (former Marine) was writhing in pain on the floor of a VA hospital last fall, in the wee hours of the morning, while waiting for the pharmacy and urgent care to open. We took him to the ER at a civilian hospital, but the prescription was SO MUCH. Hence the VA’s pharmacy. Bad, bad ear infection. Punctured eardrum. Very scary, at the time. Strong antibiotics, pain medication, and rest – then he felt much better. So glad Cliff is better! Thanks for sharing Anna. It sounds like that was pretty recent then? Yes, the Fall of 2017. I am grateful that my husband was ultimately seen by an audiologist, who then pointed out his loss of hearing (that I’d been noticing for DECADES), and ordered his hearing aids — just sorry that he had to suffer so badly to wind up at the end. I suppose that’s just how life is. At the time I was just plain scared! It is very hard to see your protector in need of protection. Now, he is safe, AND he can hear! I do think sometimes that it was all Gods timing that we didn’t go in earlier, for the reason of misdiagnosis like that. I’m so glad that your husband got his sight back. That living in fear is the worst side effect for sure! I’m glad you were able to get your dad in there! Wow thank god he is ok! Thank you for sharing your story about your hubby. It’s scary not knowing what to do. And how fast you need to react! Thank you for sharing your story. I just have a question. Did you find out how Cliff may have contracted the meningitis? We learned that many people actually carry the virus, but not everyone gets sick from it. So he could have come in contact with someone who had the virus, but was not sick. 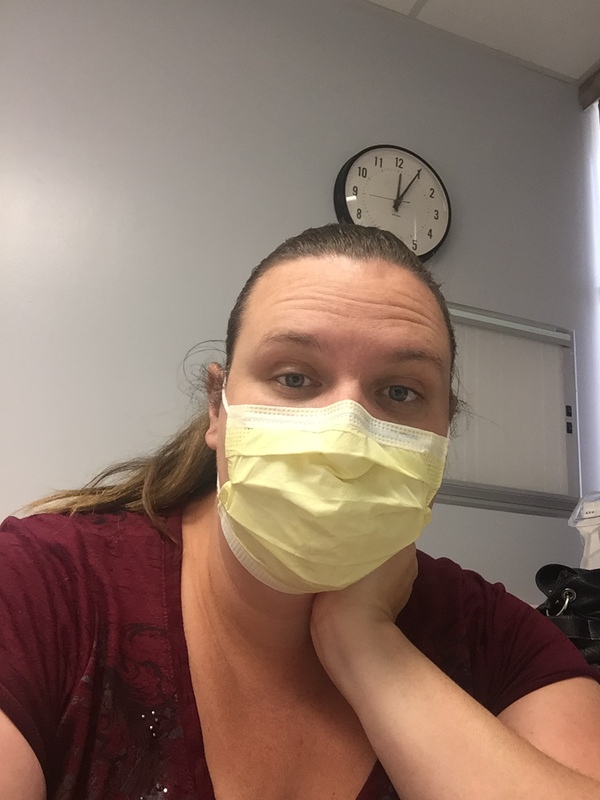 The Dr was surprised because we work from home and homeschool! But, no one we knew ever got it either. So just bad luck ultimately. Great article and reminder. Thank you. I had Meningitis when i was three years old, i was told by my mom that i nearly died.. Unfortunately, i became deaf in result from that. Wow Richard. Thanks for sharing. I know Cliff spent a lot of time researching what can happen, and I’m sorry you had that lasting effect. 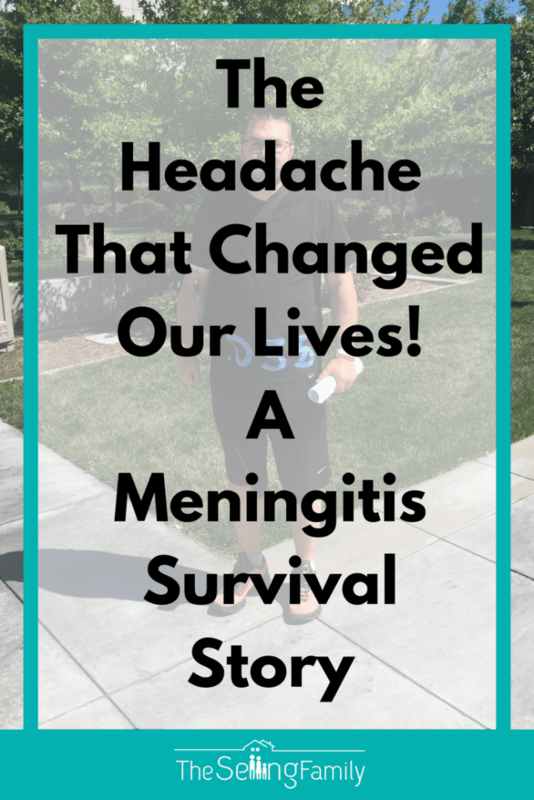 My husband had viral meningitis last November. THE scariest thing. He also was in ICU and had the “worst headache of his life”. I took him to the ER when he couldn’t figure out how to put his shoes on and didn’t know the names of our children! Thanks for sharing Ashle! I’m glad you guys went to the ER.